Speak softly and carry a big gavel? Probably not the best size for every day use, but this huge 36" oak gavel would make a great recognition award or gift for a judge, law school graduate, speaker, or out going leader of your organization. The gold brass band can be personalized for the occasion to make it a truly memorable one for the recipient. 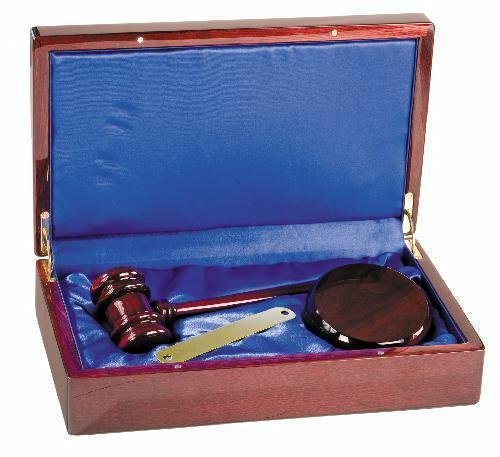 Present the new or outgoing president of your organization, a newly appointed or elected or retiring judge, or even a law school graduate with this unique square head gavel. The gavel is crafted of genuine walnut and the flat areas on the gavel head can be personalized to create a truly meaningful gift for any of these occasions.